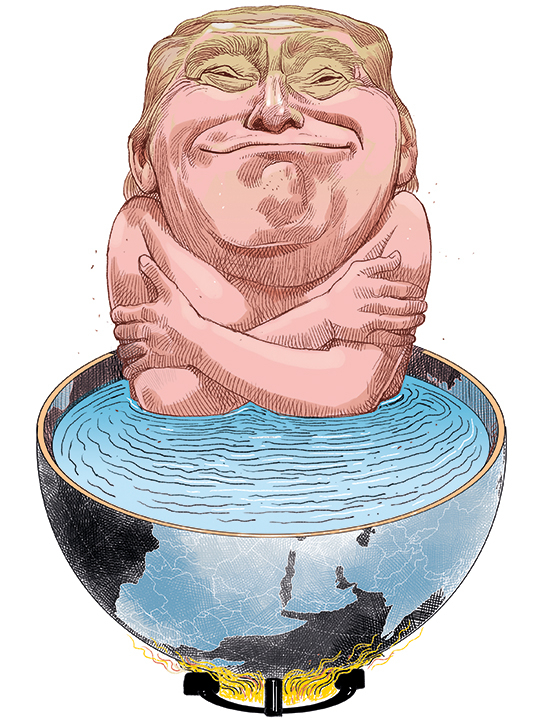 The administration of United States President Donald Trump is, it goes without saying, deeply anti-science. The latest National Climate Assessment, which details current and expected future impacts of global warming on the US, is out. True, the report was released last Friday, clearly in the hope that it would get lost in the shuffle. The good news is that the ploy didn’t work. The assessment basically confirms, with a great deal of additional detail, what anyone following climate science already knew: Climate change poses a major threat, and some of its adverse effects are already being felt. For example, the report, written before the latest California disaster, highlights the growing risks of wildfire in the Southwest; global warming, not failure to rake the leaves, is why the fires are getting ever bigger and more dangerous. But the Trump administration and its allies in Congress will, of course, ignore this analysis. Denying climate change, no matter what the evidence, has become a core Republican principle. And it’s worth trying to understand both how that happened and the sheer depravity involved in being a denialist at this point. Wait, isn’t depravity too strong a term? Aren’t people allowed to disagree with conventional wisdom, even if that wisdom is supported by overwhelming scientific consensus? Yes, they are — as long as their arguments are made in good faith. But there are almost no good-faith climate-change deniers. And denying science for profit, political advantage or ego satisfaction is not OK; when failure to act on the science may have terrible consequences, denial is, as I said, depraved. The best recent book I’ve read on all this is The Madhouse Effect by Michael E. Mann, a leading climate scientist. As Mann explains, climate denial actually follows in the footsteps of earlier science denial, beginning with the long campaign by tobacco companies to confuse the public about the dangers of smoking. The shocking truth is that by the 1950s, these companies knew that smoking caused lung cancer; but they spent large sums propping up the appearance that there was a real controversy about this link. In other words, they were aware that their product was killing people, but they tried to keep the public from understanding this fact so they could keep earning profits. That qualifies as depravity, doesn’t it? In many ways, climate denialism resembles cancer denialism. Businesses with a financial interest in confusing the public — in this case, fossil-fuel companies — are prime movers. As far as I can tell, every one of the handful of well-known scientists who have expressed climate scepticism has received large sums of money from these companies or from dark money conduits like DonorsTrust — the same conduit, as it happens, that supported Matthew Whitaker, the new acting attorney general, before he joined the Trump administration. But climate denial has sunk deeper political roots than cancer denial ever did. In practice, you can’t be a modern Republican in good standing unless you deny the reality of global warming, assert that it has natural causes or insist that nothing can be done about it without destroying the economy. You also have to either accept or acquiesce in wild claims that the overwhelming evidence for climate change is a hoax, that it has been fabricated by a vast global conspiracy of scientists. Why would anyone go along with such things? Money is still the main answer: Almost all prominent climate deniers are on the fossil-fuel take. However, ideology is also a factor: If you take environmental issues seriously, you are led to the need for government regulation of some kind, so rigid free-market ideologues don’t want to believe that environmental concerns are real (although apparently forcing consumers to subsidise coal is fine). Finally, I have the impression that there’s an element of tough-guy posturing involved — real men don’t use renewable energy, or something. And these motives matter. If important players opposed climate action out of good-faith disagreement with the science, that would be a shame but not a sin, calling for better efforts at persuasion. As it is, however, climate denial is rooted in greed, opportunism, and ego. And opposing action for those reasons a sin. Indeed, it’s depravity, on a scale that makes cancer denial seem trivial. Smoking kills people, and tobacco companies that tried to confuse the public about that reality were being evil. But climate change isn’t just killing people; it may well kill civilisation. Trying to confuse the public about that is evil on a whole different level. Don’t some of these people have children? Paul Krugman is a Nobel Prize-winning economist and distinguished professor in the Graduate Centre Economics PhD programme and distinguished scholar at the Luxembourg Income Study Centre at the City University of New York.